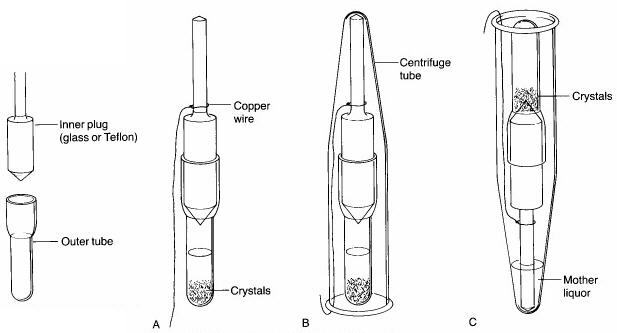 Recrystallizations can be carried out using a conical reaction vial and conventional vacuum filtration to collect the crystals on a small filter paper, or in a Craig tube, which is a device designed specifically for recrystallization of very small quantities of materials. (i) Once crystallization is complete, the mother liquors and crystals are vacuum-filtered through a small Hirsch funnel. Most commonly, the material is transferred to the filter by pouring, using a microspatula to help transfer the crystals from the vial to the filter. In cases where the crystals are fairly small and fluffy, it may be more convenient to draw the entire mixture of crystals + mother liquors into a Pasteur pipet and transfer them to the Hirsch funnel that way. (ii) If the crystals adhere to the side of the flask, then filtration is unnecessary. Simply use a filter-tip pipet to remove the mother liquors and transfer them to another flask. Fresh, cold solvent is added to wash the crystals, and this is then removed with the pipet in the same way. The crystals are then dried using a very light stream of air or nitrogen, but care must be taken to ensure that the stream is light enough that the crystals don't get blown out of the vial. Step 1. In crystallizations where a filtration step is not required in order to remove insoluble impurities such as dirt or activated charcoal, this step can be done directly in the Craig tube; otherwise, a small test tube is used. The solid is placed in the Craig tube and the appropriate solvent is heated to boiling in a test tube placed in a sand bath. Several drops of hot solvent is added to the Craig tube, which is then heated in the sand bath while stirring continuously with a microspatula using a twirling motion. This helps dissolve the solute and prevent the boiling liquid from bumping. Additional portions of hot solvent are added until the solid is completely dissolved. Do not add too much solvent, in order to maximize the yield. Step 2. When a hot filtration is necessary, the solid should be dissolved as much as possible in a test tube as described above. Alternatively, the solid can be dissolved in the Craig tube and the liquid transferred to the test tube using a Pasteur pipet preheated with hot solvent. To draw the liquid into the pipet, expel the air from the pipet and then place the end of the pipet on the bottom of the tube, being careful not to trap any solid in the pipet. The small space between the pipet and the bottom of the tube should allow you to draw up the liquid without removing any solid. Rinse the Craig tube with a few drops of hot solvent, and then add these to the test tube. This procedure serves to perform a rough pre-filtration to remove larger pieces of solid. The Craig tube is then washed and dried. Step 3. The test tube containing the mixture is then heated in the sand bath, adding 5-10 drops of solvent to ensure that premature crystallization doesn't occur during the filtration step. To filter the mixture, take up the mixture in a filter tip pipet which has been preheated with hot solvent, and quickly transfer the liquid to the clean Craig tube. Passing the liquid through the cotton plug in the filter-tip pipet should remove the solid impurities. If this is unsuccessful, it may be necessary to add more solvent to prevent crystallization and filter the mixture through a filtering pipet. In either case, once the filtered solution has been returned to the Craig tube, it is necessary to evaporate some solvent until the solution is saturated near the boiling point of the liquid. This is best done by placing the Craig tube in the sand bath, and boiling the solution while rapidly twirling the solution with a microspatula. When a trace of solid material coating the spatula just above the level of the liquid is observed, the solution is near saturation and evaporation should be stopped. Step 4. The hot solution is cooled slowly in the Craig tube to room temperature. This is done by inserting the inner plug into the outer part of the Craig tube, and then placing the whole thing into a 10-mL Erlenmeyer flask. This provides some insulation to slow the cooling rate. The cooling rate can be slowed even further by first filling the Erlenmeyer flask with ~8 mL of hot water at a temperature below the boiling point of the solvent (be careful not to put so much water in the Erlenmeyer that the Craig tube floats). The Erlenmeyer flask containing the Craig tube is then placed on a few layers of paper and left alone to cool to room temperature. Once crystallization at room temperature is complete, the Craig tube is then placed in an ice-water bath to maximize the yield. Step 5. Once crystallization is complete, a 3" piece of copper wire is wrapped around the barrel of the inner plug of the Craig tube (see 'A' below), and a Centrifuge tube is placed over top of it. After bending the copper wire back up the side of the centrifuge tube so that the Craig tube is held securely inside it (see 'B' below), the centrifuge tube is inverted (see 'C' below). The solvent should seep out of the Craig tube, leaving the crystals behind. The tube is then centrifuged for a few minutes to complete the separation of the mother liquors from the crystals. Using a microspatula, the crystals are then scraped off the end of the inner plug or from inside the Craig tube onto a watch glass or piece of paper. Minimal drying will be necessary.